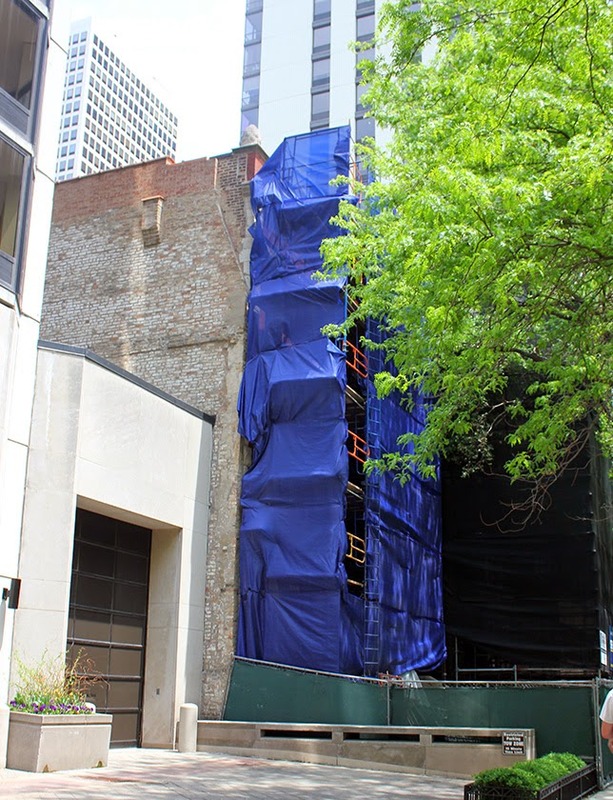 As reported in Preservation Chicago's latest newsletter, two Chicago buildings are coming down or experiencing massive alterations right now. Neither one is an officially designated landmark, but both contain huge chunks of Chicago history. And both were rooted in music. I missed photographing the first, at 52 East Bellevue Place. To put a twist on Churchill's famous quote, it could said to be a demonstration of how, “We make our buildings. And then they unmake us.” It was the longtime home of Theodore Thomas, and it was here that he died. 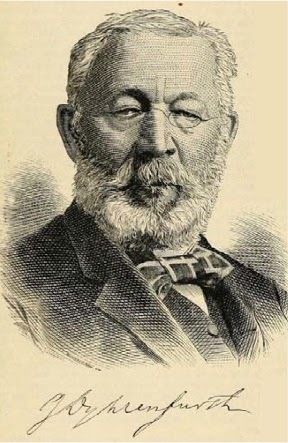 Beginning in 1855, Thomas had an astonishing career barnstorming the country conducting the Theodore Thomas Orchestra. “I would go to hell if they gave me a permanent orchestra,” he was famously to have said, and in 1891, Chicago obliged him, creating the Chicago orchestra under his leadership. 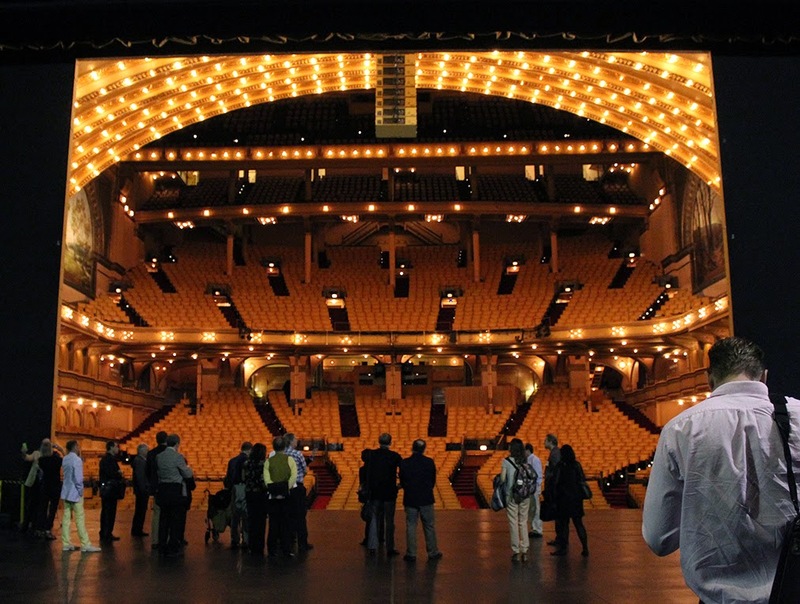 Thomas conducted in the newly opened Auditorium Theater, designed by Louis Sullivan and Dankmar Adler, but it was not a happy domicile. First, although the acoustics of the theater were legendary, the lack of any kind of shell made them less favorable to symphonic music than for opera. And the thing was just too damn big - 4,000 seats! - leaving the developing ensemble to play concerts to demoralizing, half-full houses. And if that weren't enough, the building assaulted him. In October of 1899, as Thomas was conducting a rehearsal, a heavy bolt fell from the rafters 75 feet down onto his head. The wound was just a graze, but then the bolt rebounded from the floor to make a deep cut over Thomas's left eye. He was picked up by his players and loaded into a carriage to recover at his Bellevue mansion. Thomas's tireless strength and good health - he could send an entire table shaking just by bringing his finder down hard on its surface - began a slow decline. 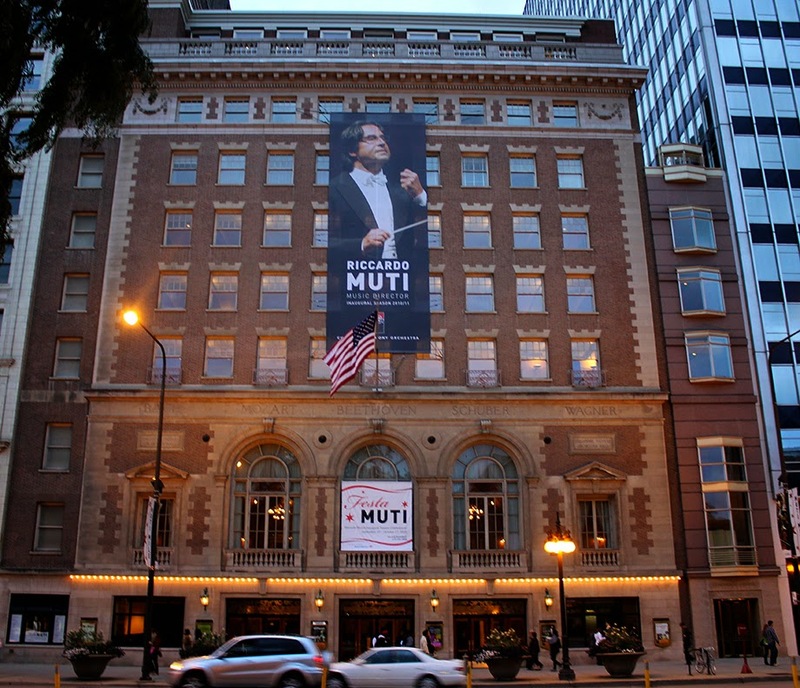 Early into the new century, the Orchestral association commissioned architect Daniel Burnham to build the ensemble its own home a couple blocks north on Michigan Avenue. The hall's dedication on December 14th was a civic triumph. Thomas walked onto the stage to a great ovation, and then to still another after the speech making, which he avoided having to respond to only by tapping his baton and launching into the overture to Tannhäuser. Despite the formal opening, the building was really not finished. It was drafty and dusty. For fourteen years, Thomas had never missed a concert or public rehearsal. On Christmas eve, he conducted what would be his last concert with the orchestra. On the morning of his next rehearsal, he found himself too weak to rise from the breakfast table. It was originally diagnosed as a bad cold, but by New Year's, Thomas took a turn for the worse, to pneumonia, and then spinal meningitis. Strychnine and oxygen were administered, but in spite (or because?) of this, a newspaper headline reported “Thomas' Life in Balance” but that he was “still alive at 2:30 a.m.” At 5:30 a.m., on January 4th, he died in his house on Bellevue. He left behind a music collection valued at $300,000 - in 1905 dollars - and the institution that today endures as the Chicago Symphony Orchestra. I'm not quite sure what's going on at the house now. The permit reads . . . 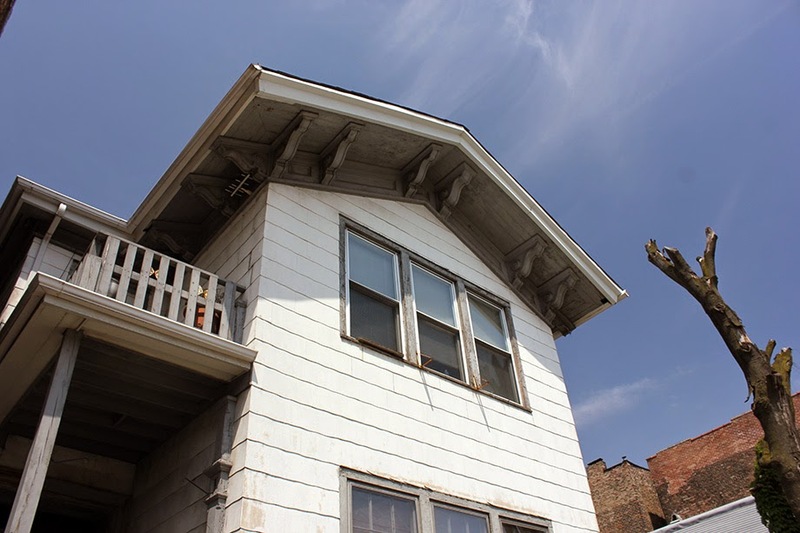 Removal of plumbing fixtures, ductwork, and non load bearing partition walls to existing 3 story single family masonry building for exploratory purposes as per plans . . .
Is it being demolished or retrofitted? What's clear is that its graceful facade is being ripped off, the building gutted, the history erased. 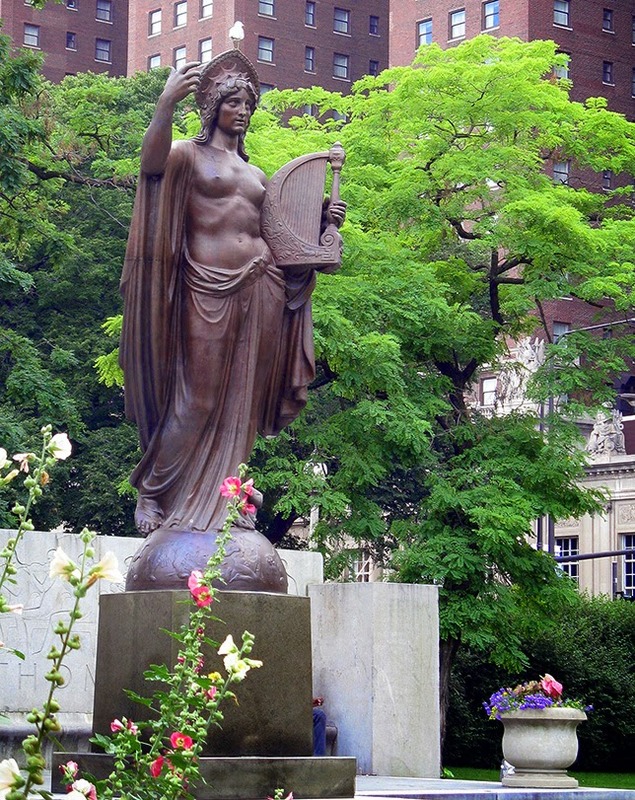 Thomas lives on in the Theodore Thomas Memorial, The Spirit of Music by Albin Polasek and Howard van Doren Shaw, in Grant Park at Michigan and Balbo. The second lost building will be easier to miss. 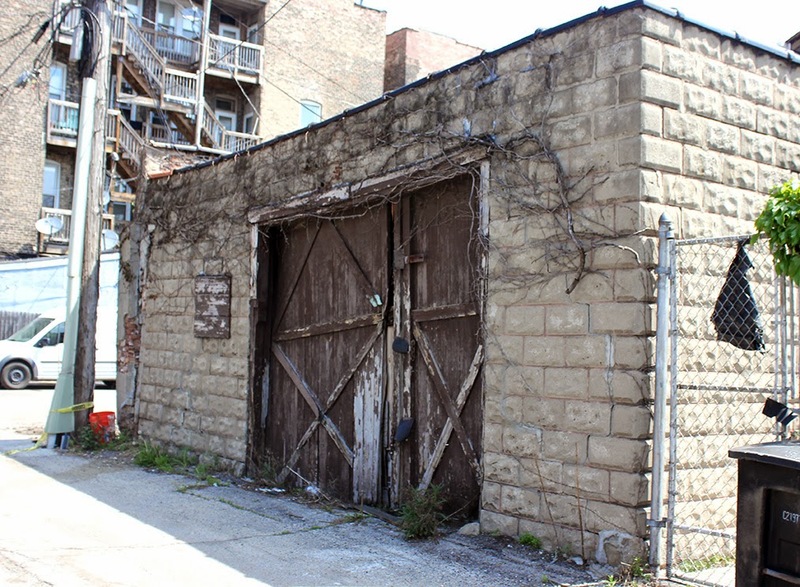 It sits in the 400 block of North Carpenter, the kind of exhausted-looking buildings we see all over, until one day we happen to notice they're gone. Even the tree in front of the house seems terminally distressed. Its West Town neighborhood is at once derelict and gentrifying. It's a trend that stands only to accelerate when thousands of Google employees move into the former Fulton Market Cold Storage Building, just a few blocks to the south, being reconstructed into a massive office complex. 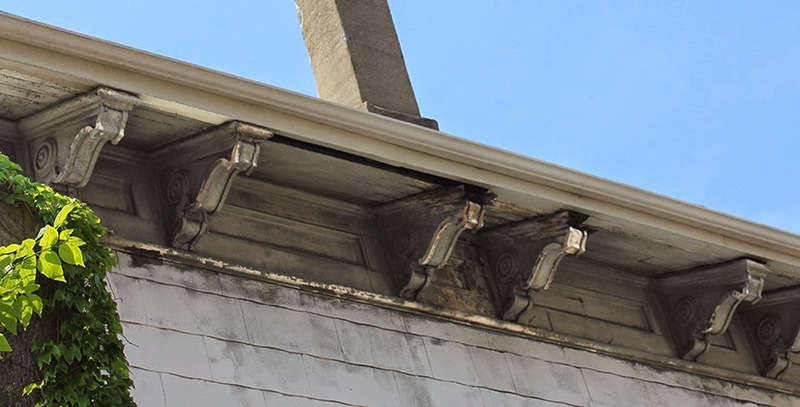 Look closely at those ornamental brackets under the eaves, however, and you realize the abject frame building at 456 North Carpenter actually has a rather extraordinary history, and we're indebted to University of Pennsylvania graduate Matthew W. Wicklund for uncovering it, in a rather splendid history of the houses and its times, which you can read here. Wicklund calls the building the Russell-Dyhrenfurth House It's a survivor of the Great Chicago Fire. When it was constructed in 1855 to a design by architect William Belden Olmstead it was at the edge of Chicago's original 1837 boundaries, in a largely unpopulated area. Only six other structures stood on the block, and only one on the block across the street. The house is of balloon-frame construction, the skeletal structural system often credited as the precursor to Chicago's classic steel-framed skyscrapers. It was built, suitably enough, for John Russell, who had made his fortune milling lumber. A substantial addition was built at the back of house in the 1860's. 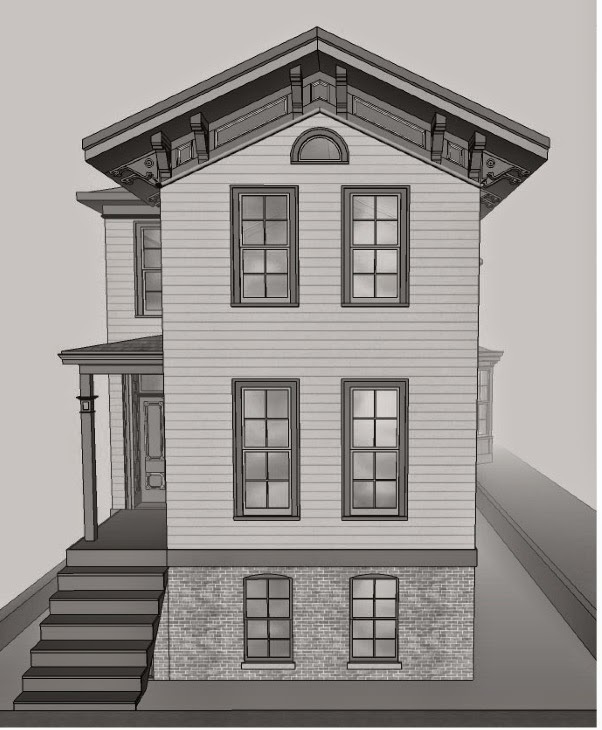 Also in that decade, the push for less sickening sanitation resulted in a sewer line being constructed along Carpenter, raising the street grade by five feet and requiring an English basement to be constructed to elevate the house to the sidewalk's new level. America in 1837 for an orchestral tour that was a critical, but not economic success. When Dyhrenfurth moved his family to Chicago permanently in 1846, he took the lesson of that tour and got a job not as a musician but as a bank clerk, developing innovative accounting methods soon adopted by other Chicago banks. 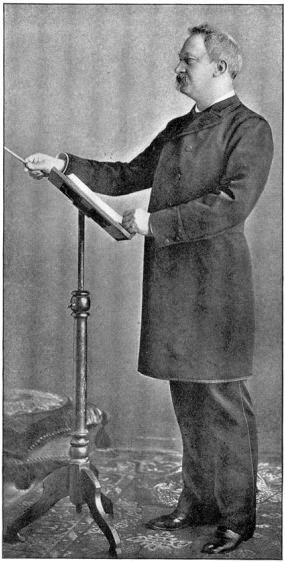 Still, music will out, and in 1850 Dyhrenfurth founded the Chicago Philharmonic Society, composed primarily of countrymen fleeing the 1848 German Revolution. For the second season, Dyhrenfurth began selling subscriptions to the Philharmonic's concerts, another innovation that was a way of securing a regular stream of revenue for performing arts organization often ruined by variations in single-ticket sales. When he was wiped out in the '57 panic, however, Dyrenfurth learned his lesson for good, and switched from music to founding a series of very successful trade schools and business colleges. The neighborhood around 456 North Carpenter continue to grow more industrial, with the Chicago and Northwestern railroad viaduct cutting through the community just south of Hubbard, much as, to a far larger scale of destruction, the Kennedy Expressway would cut through to the north in the 1950's. After the Great Fire of 1871, wood construction was proscribed by law, and a pair of handsome brick townhomes were erected just to the south of 456, setting a new style and standard. When the Dyrenfurth family moved out in 1879, the house, like many others in the area, was subdivided into five rental apartments, serving tradesmen who were first Norwegian or Swedish, and then primarily Italian. In 1926, alterations were made to the house, including the addition what is now a truly frightening garage at the rear of the property. In the 1950's, the neighborhood became largely Puerto Rican. The Montes family bought the house, and three generations lived there, until they finally sold it in 2014. 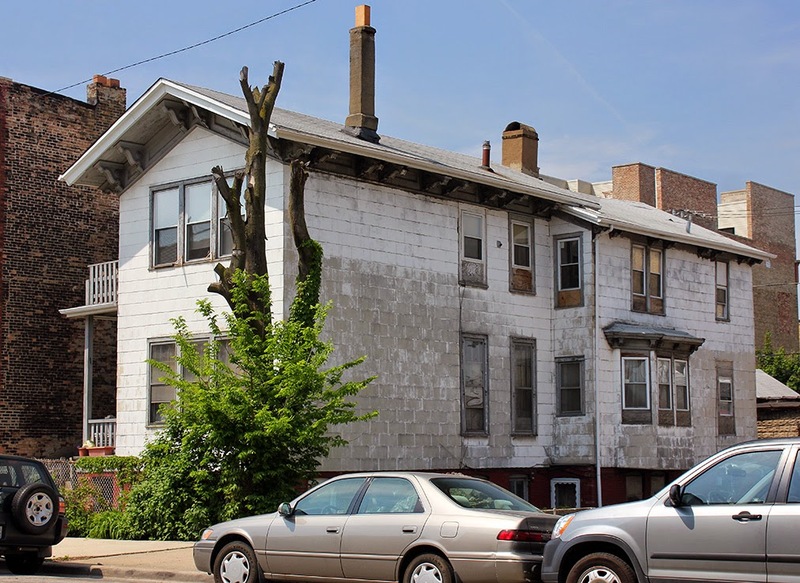 Although as you walk down Carpenter and nearby streets, you'll find any number of frame houses renovated to a modern luster, this is not to be 456's fate. It has been judged irremediable, and is about to be demolished, to be replaced by a four to five unit structure more attuned to the area's upscaling economics. A Tesla dealership is just across the alley. Very sad. 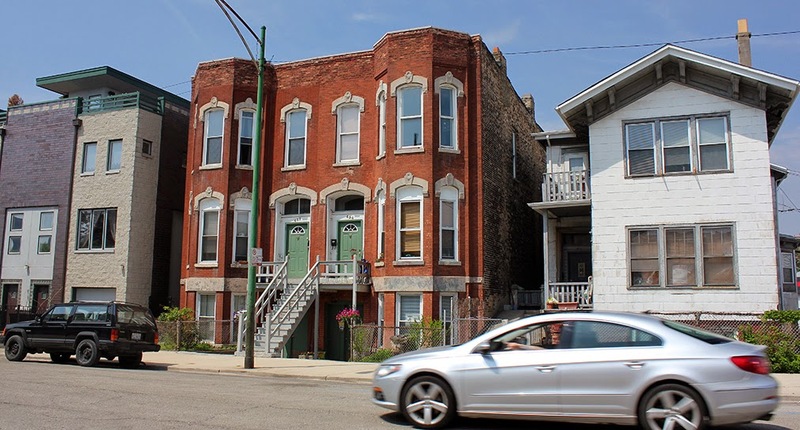 You would think that pre-fire buildings would be like the Holy Grail in Chicago, and those that remain seem to get knocked down with alarming regularity. The Theodore Thomas House and the house adjacent to it were both wholly gutted in early February, long before they were placed on the demo-delay. 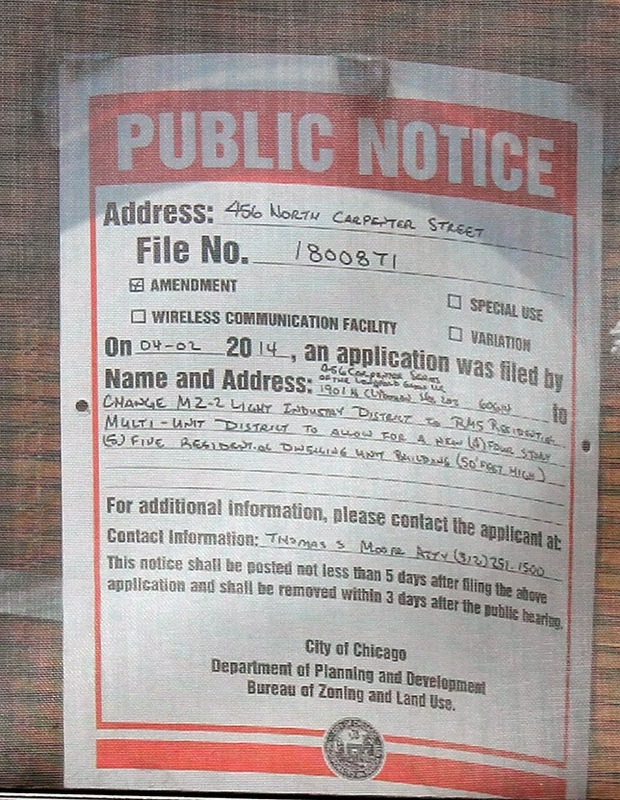 The owner of the Thomas house just happens to also own the recently landmarked Augustus Warner House on Dearborn. 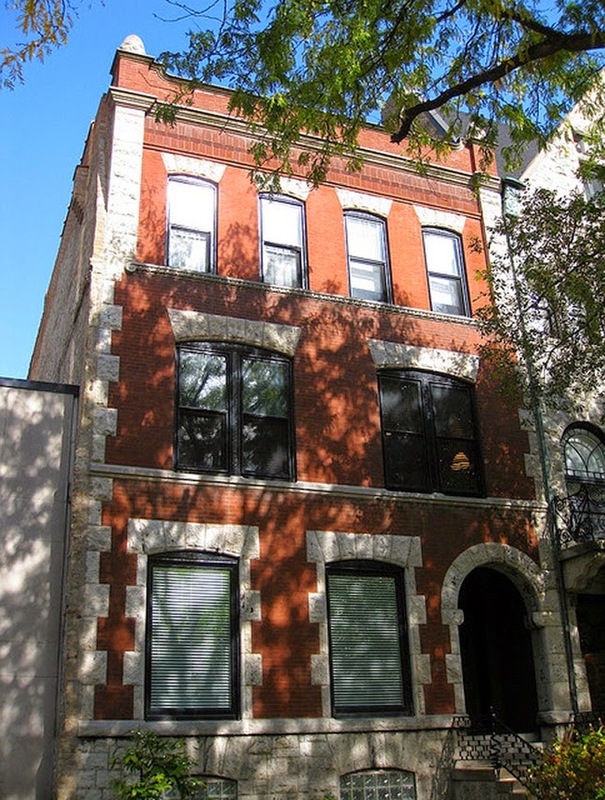 As for the Russell-Dyhrenfurth House, it may currently seem unappealing, but it certainly makes up for this lack aesthetics with its very existence and position in Chicago history. According to new evidence, the Russell family owned and rented the house from 1867 through 1908. There is a good chance that this particular house might not be lost. Thank you for addressing this preservation challenge and for drawing the curiously musical connection between these two threatened sites. 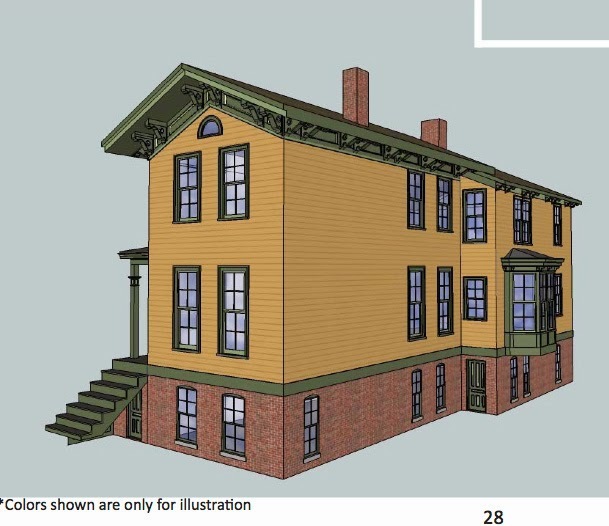 Thanks for the great blog on the Theodore Thomas house, very sad. My great great grandfather and gg uncle, as well as my grandfather, were structural engineers in Chicago (worked with Burnham before going out on their own, lots of buildings still standing). I am an architectural historian studying some of the works of architect Howard Van Doren Shaw. I was looking into his sculpture of Theodore Thomas as I had read that it had been demolished and I was curious. Turns out it was moved several times, then was damaged pretty badly, but reconstructed and moved to a corner on Michigan Avenue. Sad state for both his house and memorial, but at least the one has been saved. Thanks again for a great blog, I'll have to check into more! The statue is at Grant Park, I guess that's old information, sorry :) But what a history of relocation and damage - just glad it's still there.